Ann Arbor — the academic community we call home — is lauded for its superior secondary education and the world-renowned University of Michigan. Our town, for good reason, is therefore choked with adrenaline come May and June, when throngs of graduating high school and college seniors are given their moment to pause, reflect on a job well done, and gather the energy required to make the next transition. Caregivers, teachers and all of those who’ve nurtured a graduate’s success may, too, want to share in this moment, but might also enjoy honoring this achievement with a celebration, most of which will be complemented with food. My gift to these hostesses across town is a no-cook sandwich platter road map, which is a casual way of celebrating without causing a bead of sweat to trickle from your brow. 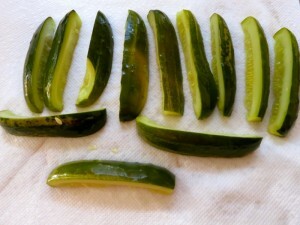 Use the best pickle spears you can find; make sure you drain them or your platter may be awash with pickle juice! After all, what could be more well-received than a custom-built sandwich? Indeed, Ann Arborites are smitten with sandwiches, which reign king and queen in our food world. I’ve often referred to our fair city as “The Little Kingdom of Sandwich,” a beloved little deli on Detroit Street occupying the throne. Our infatuation with sandwiches makes sense. Sandwiches, after all, are perfect for academic multitaskers, who’d often rather forgo cooking utensils and eat with one hand, so the other is free to tap a keyboard or hold a book. For ultimate ease, you could order a deli platter from Zingerman’s, The Back Alley Gourmet, or any one of a number of fine delis across town. But my gift to you is a sandwich platter flow chart beginning with the platter, then providing you options for managing the process through various alternatives. You will save money by making the platter yourself, and another bonus is the platter accommodates a host’s hectic schedule. Ingredients may be purchased up to 48 hours in advance, and the deli platter may be made up to 3 hours in advance, wrapped in plastic, then refrigerated. The ingredients for the sliced meat and cheese platter below make 12-16 sandwiches, but you may divide or multiply the ingredients according to the number of people you plan to serve. Typically the recommended portion of meat on a deli platter is 1/4 to 1/3 pound person. However, if the deli platter is the only item you plan to serve, your guests could easily consume 1/2 pound each. No matter how small the platter, I use at least three varieties of meat — always including a turkey or chicken breast — not only because of white meat’s popularity, but because sandwiching them between darker colored meats creates a visual divider of sorts, the end result being a more attractive platter. 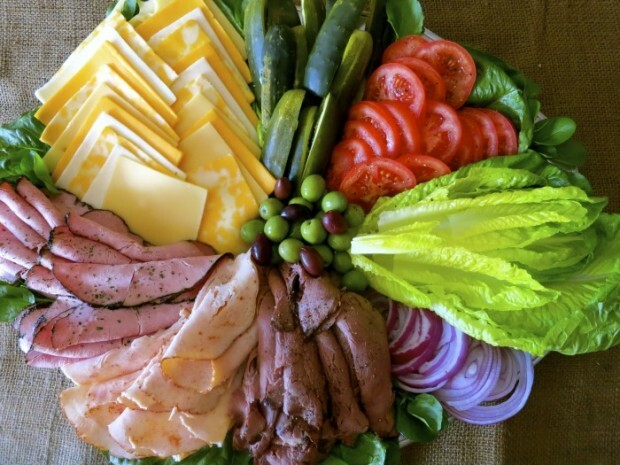 An alternative to the sliced meat and cheese platter is to make a salad sandwich platter. Substitute the sliced meats and cheese with a generous scoop each of tuna, egg and chicken salad; challah, croissants and whole-grain breads are perfect served with this platter. Or make a vegetarian platter with scoops of tabouli, hommos and baba ganoush. Substitute the sliced cheese with cubes of feta, the pickles with sliced cucumber and make sure the bread is pita. If sticking with sliced meats, you could specialize by creating an Italian-themed platter and use salami, prosciutto, pancetta, pepperoni, bresaola or capicola; provolone, romano and fresh mozzarella would be complementary cheeses. Use Italian sliced bread and sub rolls, and include extra virgin olive oil, balsamic vinegar and dried Italian herbs for sprinkling on sandwiches. If time allows, coleslaw, potato salad, pasta salad, and/or a fruit salad finished with a tray of brownies, would be fine accompaniments to the platter. The more sides you include, the more people your sandwich platter will serve. Or hone simplicity to a science and open bags of chips — there are some interesting varieties out there — what a concept! Click here for a Graduation Recipe Party Slideshow. Line platter or basket with large romaine leaves. Roll meats loosely or fold in half and place on platter, in a pinwheel design (review photo) taking care that the white meat(s) are arranged in between the brown and pink-red meats. After arranging meats, and clockwise in this order, arrange cheeses (alternating colors), then pickles, tomatoes, romaine and red onions. In the center of the platter, spoon the olives. Sprinkle dart meats with cracked pepper and white meats with paprika. Place small serving forks or tongs next to or on top of the platter. In the remaining basket or platter, arrange your choice of breads. Place condiments next to the bread basket and serve.